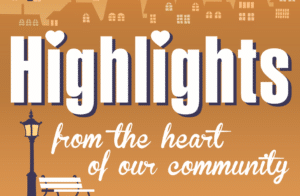 The show airing May 21, 2018 – May 28, 2018 ‘highlights’ the WV Music Hall of Fame & the YMCA’s 33rd Annual Corporate Cup. We interviewed Michael Lipton, Director of WV Music Hall of Fame. He recapped their Hall of Fame Ceremony held in February. Then he turned his attention to their upcoming 7th Annual Garden Party. 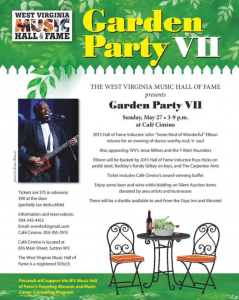 This year’s Garden Party fundraiser is set for Sunday, May 27th from 3-9:00 p.m. at Cafe Cimino in Sutton, WV. WVMHoF inductee John “Some Kind of Wonderful” Ellison returns for a night of rock ‘n’ soul. Ellison, whose enthusiasm is infectious, will be backed by WVMHoF Inductee Russ Hicks, Beckley’s Randy Gilkey and The Carpenter Ants. Also appearing are WVMHoF inductee Bob Thompson and WV jazz guitar great Vince Lewis, and WV’s Jesse Milnes and the T-Mart Rounders. WVMHoF is a registered 501(c)3. A portion of the ticket price is tax deductible. Funds from this year’s event will support The WVMHoF Traveling Museum and Music Career Counseling Program. To date, the Traveling Museum has visited more than 600 schools and reached more than 16,000 students; the Music Career Counseling Program provides an introduction and a career path for performing and non-performing careers in the music industry. We also talked with Chris Wade, Adult & Youth Sports Director at the YMCA of Kanawha Valley. Chris talked about his job description at the Y then got into his role as the Coordinator of the YMCA Corporate Cup. This is the 33rd year for THE CUP, and Chris’s second year to spearhead the event. This year’s Corporate Cup begins on June 2, 2018. Click here for register form. corporate cup 2018 registration form. Call Chris to enter you company. He can be reached at 304-340-3527.